Very good read and I especially like the point about a pitcher aiming for the left or right knee (OR) left or right shoulder of the catcher. And agreed, the pitcher should easily be able to visualize this. While I somewhat agree with your philosophy, I can't agree all the way. I am a catcher and sometimes moving the glove to catch the pitch by a shoulder can get in the way of actually holding on to the ball. Sometimes the color of the jersey and the sun come into the picture and so it is easier to to move the body as well as the glove to make sure I catch the ball squarely so it does not pop out of the glove. Good philosophy but i have to disagree...coaching baseball (high school 4yrs and college 10+) for over 15 years and playing over 20 yrs i have noticed that even mature pitchers (college and minors) have too much to think about. I have a philosophy "KEEP IT SIMPLE" throw the ball to the target. Pitching is about finesse (in and out) and keeping the batters off balance but If the catcher stays down the middle of the plate and just moves his glove to the spot where it is pitched, you might as well play and watch slow pitch softball or have BP. Here's a scenario Miguel Cabrera or Albert Pujols is up and you have CC Sabathia throwing on the mound and the catcher stays right down the middle...you don't think these guys will won't go yard on any given pitch. these guys hit homeruns when the ball is seven inches off the plate. I agree with Ramie. You cannot continually setup right in the middle of the plate. I have been catching for 20+ years and most pitchers want you to "frame the pitch" so that they can throw to that area. You can keep your body positioning somewhat centered (obviously your not going to setup 2 ft off the plate) but can move the glove to the position that you are expecting or calling the pitch to. Setting up centered every time gives the pitcher a lack of reference. Many pitchers I have caught simply rely on the catcher to choose where the pitch should be. The catcher is the one that most likely remembers that a particular batter swung miserably at a pitch in the dirt previously and the pitcher is going to be successful only when he has this information. This is especially true in most leagues where there is no real information on hitters strengths, etc. Hope that makes sense. How about we use technology in MLB and use Pitch Tracker to call the strikes in every game. Very easily done. Have a small shield in every home plate umpires mask and when Pitch Tracker sees that the baseball touches the zone a small flash of light goes on in the mask and the umpire raises his arm. If I'm not mistaken, Pitch Tracker is instantaneous on the screen so it would be the same in the umpires mask. No need to do anything on the balls out of the zone because a lot of umpires don't say anything on a ball outside the zone anyhow. Check swings would still be the umpires call as would foul balls and balls touching the ground during swings. We have the technology, let's use it. Does anyone foresee any problems that I'm not seeing? 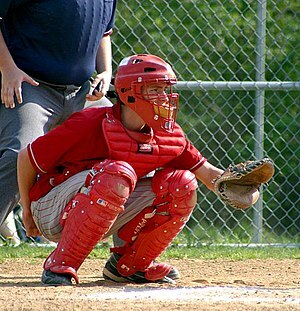 As far as amateur baseball, personally I wanted my catcher to move very late in the delivery to the spot that I wanted him to be at when I delivered the ball. The less movement for the umpire to see the better. If a pitcher is that wild or all over the place I could understand stating in the middle buy only because the catcher would rather move his glove from the middle of the plate to the corner than from corner to corner. And I know that the immobile catcher doesn't get as many breaking ball strikes called either because we had this situation with a catcher many years ago in the big leagues and every pitcher didn't like throwing to him because he did didn't move. But also, don't forget about setting up inside out outside because of the runners on base or possible pitch outs. Kip, interesting advice, and it sounds logical. However, isn't pitch tracker only in 2D? How would the technology differentiate between a batter up in the box, in the middle, or at the back, in essence, 3D? The plate is the plate and if it crosses the plate in the zone it should be a strike, no? From my understanding the batters box has nothing to do with the strike zone. The hitting zone is completely different from the strike zone. But Steve, I've been wrong before. Also, I have seen many games on tv where they show the zone from the side as well as from the front, is this what you mean by 3D? And there have been pitches that catch the lower front of the zone and not the middle or the back of it. I would think that a lot of the umpires would like to use this method because it takes an element out of the game for them. It doesn't make them useless but rather just as important. The game and technology are evolving and how balls and strikes are called game to game affects each and every game, why not make it 100% consistent. Has anyone else been been following Pitch Tracker compared to the umpires calls in the post season? There was one pitch called a ball that Pitch Tracker had as a strike and it would have ended the game and it was a close game. From there, anything could have happened and the outcome could change in an instant. Personally, I would never want to take the umpire out of the game but if we could get sensors in place so the umpire couldn't miss the calls that would make everyone a bit more easy and less arguments during the games. Tennis uses technology for balls close to the line, baseball could use that technology for fair balls. perhaps this is my lack of total knowledge of Pitch Tracker, but what about the difference in every hitter? unless it's been changed again, i remember the top of zone set as the midpoint between the batter's waist and shoulders, the bottom as the hollow below the knees. or maybe it's the kneecaps. the width is set and always the same. but up & down will change. as i write this, i have to ask: how does this work? are there sensors in the plate? the ball? Computers could easily make everyone's strike zone different even from at bat to at bat. Technology for balls and strikes has been around along long time. Although vaguely, about 25-30 years ago someone invented a home plate that would call balls and strikes perfectly every time even depending on the hitters heights. Problem was the plate had to be 100% dust free every pitch. We all know why that one wasn't used. seems to me your argument should be directed towards the practice of balls and strikes being determined not on actual location, but rather on where and how the catcher represents the location of the pitch. "I remind you that I am not generally for the pitcher, being a batter and position player, but I believe the correct strike zone helps all, including batters, who do not have to worry as much about pitches 3 to 4 inches off the plate being called strikes, because the catcher caught it in the middle of his body." to me, I've felt that a pitched ball is either a ball or strike based on the rules, which is a function of the actual location of the pitched ball and its' path. it either passed within the area designated as a strike and is called a strike, or outside of that area, and is a ball.